Pet hedgehogs depend on us to provide quality care throughout their life and to recognize any potential health concerns. You should visually inspect your hedgehog everyday while handling your hedgie and look for any signs of change or concerns. An observant owner may detect potential problems while they are still treatable, thus ensuring greater health and longevity of their pet. 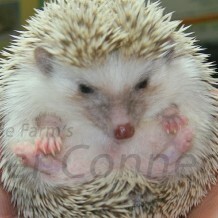 Other hedgehogs are plumper, but they should not be so fat that they cannot easily roll into a ball. The hedgehog’s bowel movements should be similar in color to the hedgehog’s food. Green droppings or diarrhea are signs of illness and stress. We encourage our customers to visit a veterinarian for a new-pet visit. The purpose of this visit is to establish a relationship with your vet and to monitor the transition from our home to your home. Annual well-pet visits are as important to hedgehogs as they are to other pets and even for our own personal physical well-being. A trained professional may be able to detect or recognize slight changes in your hedgehog that could indicate a potential problem. Do not attempt veterinary care yourself. If you have to see the veterinarian it is suggested that you have someone go with you so they can hold the box on the way there to help prevent some of the bumping and vibrations. The last thing you want is a car sick hedgehog that they vet can’t treat. Records of your pet’s growth, health, and habits are invaluable tools to monitor changes in your pet. The first important details in your record keeping are when and where you purchased your hedgehog, as well as the parent and birth information if available. Most people think they will remember such pertinent facts, but within a short amount of time details are forgotten. Many hedgehog owners routinely weigh their pets on a small kitchen scale. Most find that weighing their hedgehog in grams is easier to track rather than in ounces and pounds. Weight can fluctuate with bowl movements and eating so it is important to weigh your pet at approximately the same time each weighing session. Sudden increases or decreases in weight are a clue to your pet’s health status. Tracking your hedgehog’s eating and treat habits may also be quite beneficial. Record when you purchased your food, what kind, and how your hedgehog responded to any changes.